This book is basically a chocolate lovers dream come true. It contains good old fashioned home baking like chocolate and vanilla marble cake, chocolate brownies and shortbread and you also have show stopping desserts such as apricot and chocolate Charlotte and chocolate and chestnut truffle cakes. 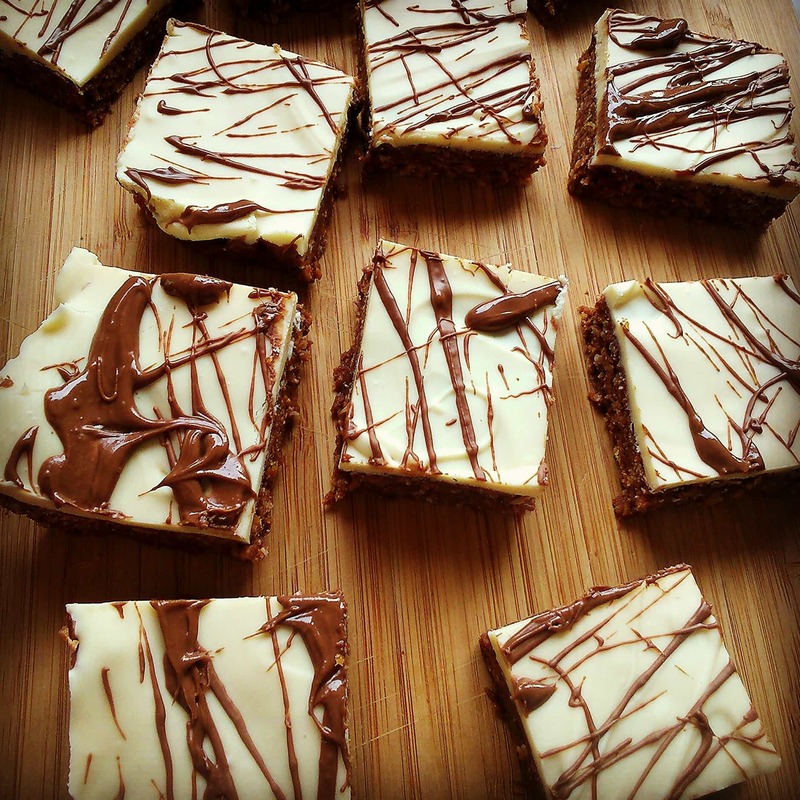 I decided to make these easy honey and milk chocolate bars first. 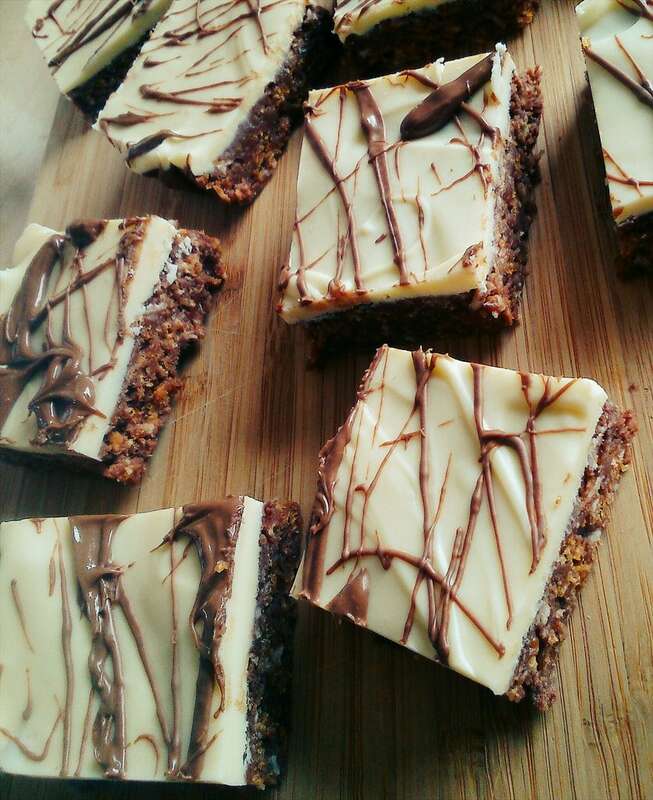 They are very similar to a traybake my Gran used to make with coconut and cornflakes. I loved it and these bars brought back fond memories for me. Isn’t it great how food can transport you back to a certain time and place? Eric’s recipe called for rice crispies, but I didn’t have any so I used cornflakes, just like my Gran did. Grease an 18cm square baking tin and line with parchment. In a medium sized saucepan, melt the milk chocolate, butter, honey and condensed milk over a low heat. Take off the heat and stir in the cornflakes and coconut. Pour into the lined tin and refrigerate for at least 30 minutes to set. Melt the white chocolate in a heatproof bowl placed over a pan of simmering water. Once melted and smooth, leave to cool for a few minutes then pour over the chilled base. Place in the fridge again to allow the chocolate to firm up, at least 30 minutes – 1 hour. Melt the remaining 25g milk chocolate, then drizzle over the white chocolate. Leave to set at room temperature. Cut into bars. Yum, they look delicious. Definitely going to give them a go and maybe buy the book too!! Thanks. If you have a sweet tooth you’ll love them!